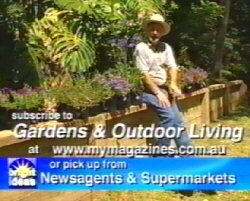 You can easily build a simple garden wall with the help of Gardens and Outdoor living magazine. The wall can be built with any shape timbers such as logs, slabs or splits. You’ll need to use a well treated timber if the wall is built close to the ground, Ironwood H4 treated pine is a perfect choice for your landscaping needs it’s strong, durable and looks good too. For more information pick up the latest issue of Gardens and Outdoor living magazine, available from all leading newsagents and supermarkets.